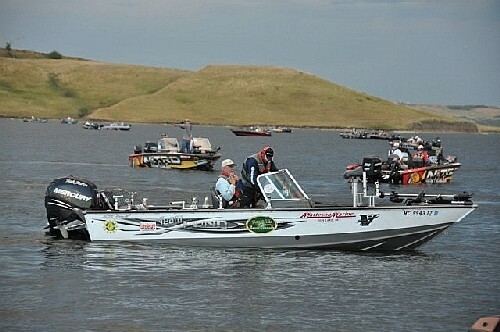 The bite has been absolutely stellar on the much higher than last year Oahe reservoir, and according to local favorite and South Dakota Walleye Pro Chad Schilling, the fish stayed in the area this year and are much easier to locate and catch. The weather for the three day event looks to be hot today, hitting highs in the low 90’s, and cooler tomorrow with hghs in the 80’s and winds in the 12 MPH range switching from SSE today to NNW tomorrow as the cool front rolls through. Saturday promises to be even cooler, with highs in the 70’s and fair skies. This will be a shootout with the AIM CRR format allowing the Pros to register their top 7 fish, and fish all day with no restrictions, slots, or limits to worry about. The AIM Akaska event is in conjunction with the South Dakota Walleye Classic and Festival headquartered in Akaska, offering family activities, the AIM competition, live music, and much more. AIM live virtual weigh in coverage begins at 4 PM today!